Experience Fayetteville presents Winter Solstice Art Action on the first day of winter, Thursday, December 21, at the Historic Walker Stone house in downtown Fayetteville. The festivities will go from 2:00 p.m. to 7:00 p.m. at the Walker Stone House but the fun will continue into the night with several galleries and studios remaining open late into the evening. Robert Earl Keen’s Fam-O-Lee Back to the Country Jamboree with special guests debuts at Walton Arts Center on Wednesday, Dec. 13 at 7 pm. Joe Landry's adaptation of It's A Wonderful Life comes to TheatreSquared in Fayetteville December 29-31. Directed by Jeff Church, this inventive twist on Frank Capra’s classic film brings the ever-timely story of disaster, redemption and holiday magic to life on stage before your eyes and ears. Join Cattywampus Co-Op for the second annual Wampus Wonderland Holiday Craft Show! Taking place on Saturday, December 2nd, this year they're moving to the Fayetteville Town Center in downtown Fayetteville. This year’s Fayetteville Visitor’s Guide features four profiles from a handful of influential locals to give visitors an inside track on some of the best things to do, places to eat and shop, and must-experiences while in Fayetteville. One of our profilees is Wade Ogle, owner of Block Street Records right off the Historic Downtown Square. The Little Craft Show returns to the Fayetteville Town Center November 24-25 for all your holiday shopping needs! 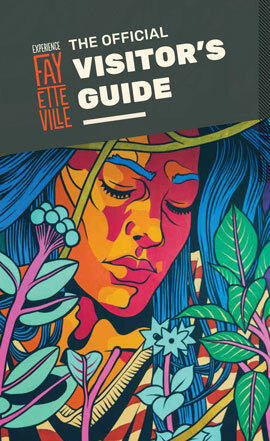 This year’s Fayetteville Visitor’s Guide features four profiles from a handful of influential locals to give visitors an inside track on some of the best things to do, places to eat and shop, and must-experiences while in Fayetteville. 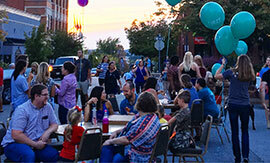 One of our profilees is Kirsten Blowers, owner of Riffraff on the Historic Downtown Square. Everyone wants to feel cozy during a vacation stay, and for some a historic or quaint feel is the preferred atmosphere when resting their head or taking a break from eating, shopping, walking and sight-seeing. Fayetteville has hotels of all price ranges, including several bed-and-breakfast hotels located near the most popular things to do in Fayetteville.